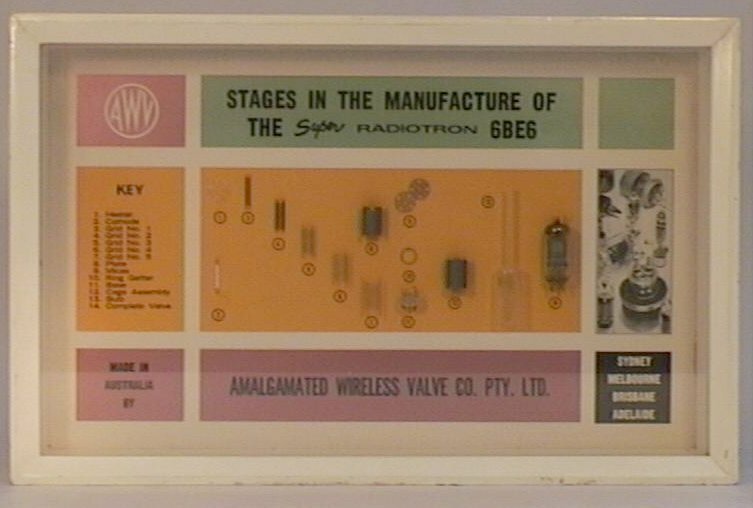 White painted frame with glass cover houses board displaying main components and steps in manufacture of thermionic heptode valve 6BE6. Developed extensively in the 1930's, electron valves (commonly referred to as electron tubes in the USA) were used in a wide range of applications including the circuitry of radios, transmitter/receivers, televisions and the first computers, before the advent of transistor technology. Our display specimen gives an insight into the 'heart' of early electronics showing the assembly of a thermionic heptode (7 electrodes) Super Radiotron 6BE6 valve with seven electrodes, manufactured - as the name indicates - for use as an amplifier in radio technology. The main components of the electron valve displayed on the board are: heater element, cathode, grids 1 to 5, plate, micas, ring getter, base, cage assembly, bulb and a completely assembled valve. Electron valves work by generating electrons at the cathode which move in the direction of the positive anode allowing a current to flow. No current flows, however, if the anode is not positive and it is this characteristic that allows the valve to act as a rectifier of AC current. Grids placed between the cathode and anode impede and repel the flow of electrons, thus altering the characteristics of the valve and hence its applications. Common types of valves include the tetrode and pentode, with two and three grids respectively. Early valves were large and fragile, before the manufacturing of smaller ones. An electron valve will be destroyed if heated to more than 20°C above its maximum operating temperature. In their heyday electron valves were produced all over the world with manufacturing plants also here in Australia in Sydney, Melbourne and Adelaide. Today they are still found in high power systems, televisions and are valued by the military due to their ability to resist voltage pulses, such as that created by an atmospheric nuclear explosion, which in many cases will destroy transistors. 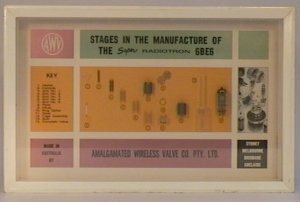 An accompanying Phillips brochure to the display provides a thorough explanation of the manufacturing of electron valves.